Chanteur Country US né le 2 Mars 1959 à Paducah (Kentucky). 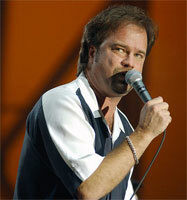 Larry Stewart est mieux connu comme le chanteur du groupe Restless Heart. Best known as the frontman for the Vocals group Restless Heart, singer Larry Stewart first came to Nashville with hopes of a career in baseball, not music; the recipient of an athletic scholarship to Nashville's Belmont College, he quickly found himself drawn to the music business instead and decided to pursue a career as a performer. After working a series of menial industry jobs, his Vocalss on a series of demo recordings helped win him the lead spot with Restless Heart. 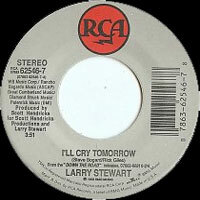 After leaving the group, Stewart issued his solo debut, Down the Road, in 1993. 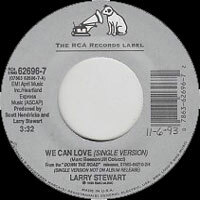 Heart Like a Hurricane followed a year later, and in 1996 he returned with Why Can't You. 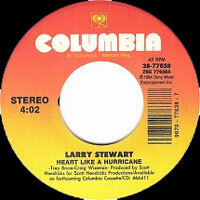 Although his albums had usually contained a straight-up pop tune or two, Stewart made a more pronounced step in that direction with 1999's Learning to Breathe. 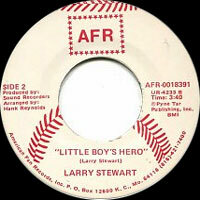 1985 SP AFR AFR-0018391 (US) . 03/1993 SP RCA 62474-7 (US) . 06/1993 SP RCA 62546-7 (US) . 10/1993 SP RCA 62696-7 (US) . 08/1994 SP COLUMBIA 38-77638 (US) . 11/1994 SP COLUMBIA 38-77753 (US) . 03/1995 SP COLUMBIA 38-77857 (US) . 07/1996 SP COLUMBIA 38-78307 (US) .